This is my second bottle of Cadillacquer's Julia. Last Christmas season, I gave my first bottle to a friend, who kept going on about how much she really liked it Today I wanted to wear a white polish with some pizzazz! Also, I have a major craving for lemon bars or lemon pound cake (maybe both), and Julia reminds me of the frosting on these dessert with lemon zest sprinkled on top. 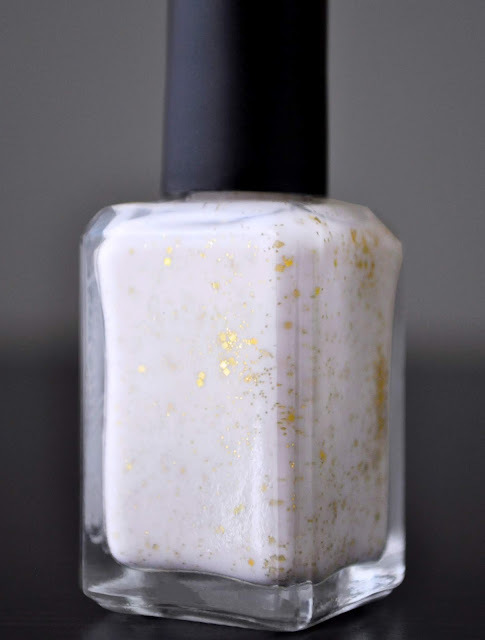 Julia is an ever-so slight, grayish tinged cream white crelly, with various sizes of square, and hexagon-shaped holographic gold glitter. The formula is sheer and patchy on the first coat; minor unevenness on the second; and, opaque on the third. Personally, I prefer to apply a fourth coat because I'm greedy, and I like to buildup the glitter. The finish is texture-free, but somewhat dull; so, it needs a top coat.